If you ever go to the famous annual celebration of Bavarian culture (known worldwide as Oktoberfest, maybe you've heard of it? ), that's one word German word you'll definitely want to learn. You'll be saying it often as you cheerfully raise your beer glass to toast with all of your new friends! 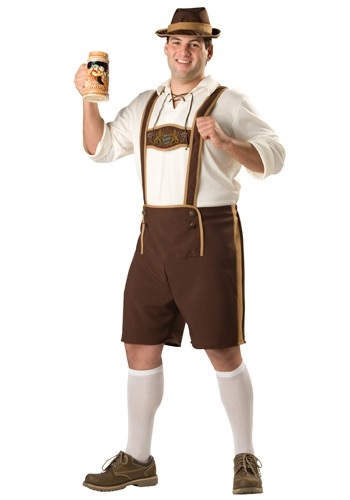 It'll also come in handy any other times you're celebrating in this festive Plus Size Bavarian Guy Costume! Whether you're strolling around a beer garden, sipping some deliciously malty nectar of the gods and eating pretzels and hot cheese with your buddies, or you're at a less traditional celebration with costumes and sudsy beverages of its own, this outfit will have you looking ready for good times! In fact, you'll quickly realize that it's practically impossible to have a bad time while wearing lederhosen. Even the word “lederhosen” itself is fun to say, in addition to being a fantastically festive style to party in. So, if you are wearing this costume and somehow manage to not have a great time, we suggest refilling your beer stein and seeing if that raises your spirits. You won't have to worry about bad times, though, since this Bavarian-style outfit is the kind of traditional look that can keep celebrations like Oktoberfest going strong for weeks! The lace-up tunic, earth-toned lederhosen, and matching brimmed hat help give you a touch of old world Alpine style, which you can dance around in, or just feast, drink, and be merry. If you're celebrating with a date, have your fraulein dress up in one of our Bavarian Girl costumes for a German couple costume. After all, shouting “Prost!” is always more fun in groups!